Fall sports season wrap-up and highlights. Led by Captains Blake Hall ’19 and Xander Mtimet ’19, a young Laker team covered over 2100 miles this fall in an impressive campaign. Sophomore Sam McGinley led the way with a 17:30 season best over 5000 meters, while Freshmen Sam Macris (17:33) and Liam McClure (17:36) weren’t far behind. Freshmen Gabe Johnson (18:22) and Will Beckford (18:27) rounded out the regular scorers for BL. Freshman Barclay Reith was named the squad’s Most Improved runner after dropping his personal best from 33:05 early in the season to 20:44 en route to a 14th place finish in the JV race at the MIAA Championship meet at McDaniel College. The JV team placed 5th overall in our conference, proving that our young, developing team has the potential to be a serious contender in the B Conference over the next three years. A 4-6 season (3-3 in conference) for Varsity Football was simultaneously marked by brilliant moments and inconsistency, as injuries and turnovers plagued the team throughout the Fall. The Captains, running back Josh Pugh ’19 and free safety Gio Biggers ’19, stood out, as did athlete Jyair Thomas ‘19. Linebacker Kevin Davis ‘19 paced the defense with 106 tackles, with Biggers and Justin Waters ‘20 registering 77 and 54, respectively. Josh Jones ‘20 and JT Morton ‘20 each had three sacks, and in the secondary, safety Carlos Davis ’19 picked off 4 passes. Offensively Pugh carried the ball 132 times for 720 yards, while Nick Lizana ’19 had 20 receptions for 357 yards and a touchdown. The boys proved to be a resilient group and worked to improve throughout the season. With many members of a successful JV moving up, the team looks to make more noise in the Fall of 2019. JV Football battled adversity early in the year, as the heat forced them to practice for a full month before getting to experience game action. The season was defined by consistent growth by a maturing team that bought into the program’s “One Heartbeat” theme and learned to trust each other. This may have been most on display during their comeback effort versus Catoctin High School; the kids had each other’s back in a game that became a turning point in the season. Down 28-6 at the half in a “mud bowl,” they scored 20 unanswered points in the final two quarters to bring the final score to 28-26. At Curley, in a game dedicated to Mattheu Thomas ‘19, they cruised to a 62-24 victory. The team then defeated St. Paul’s 18-14 to secure the JV B Conference Championship. Quarterback Dom Pietramala ’22 was brilliant, and Captains Jason Skidmore ‘21, Malachi Rice ‘21, and Drew Klima ’21 led the team to a 5-1 record in conference play in what was truly a magical season. Thank you to the staff (Coaches Smith, Jones, and Bruno) for their time, talent, passion, and patience throughout the entire season. Thanks also for being so dedicated to our boys and our program. ONE HEARTBEAT. The Varsity Volleyball team had strong leaders in Senior Captains Ari Wister and Connor Stevens. While their 7-10 record was not reflective of their level of competitive play, their performance against Gilman, the eventual conference champion, was eye-opening. In two of the three matches the Lakers played against the Greyhounds, BL took games off of them while also taking two games they eventually lost to extra points. The Lakers also swept archrival St. Paul’s twice. Juniors Michael Foster (setter) and Jordan Brooks (libero) stood out alongside Wister (outside hitter) and Stevens (right side hitter). Seniors Kwaku Akkufo, Josh Butler, and Andrew Grover contributed despite never having played volleyball before. The team improved all season but unfortunately did not have quite enough to defeat Gilman in the playoffs. While the team will be graduating seven players this year, the five returners will look to combine with several players moving up from the JV for a successful 2019. The Lakers JV squad finished the season 7-9, but this record was not indicative of how the team played. Led by Co-Captains Liam Karey ‘21 (outside hitter) and Will Alokones ’20 (right side hitter), the team finished just outside of the top 4 in the conference and therefore just missed the playoffs. A win in their final match would have clinched a playoff birth, but this was a young team with 7 members who were either freshmen or new to the sport. First-time setter Johngideon Bedford ’21 stepped and performed admirably in a very difficult role. The team established a good base this year to move further forward next season. 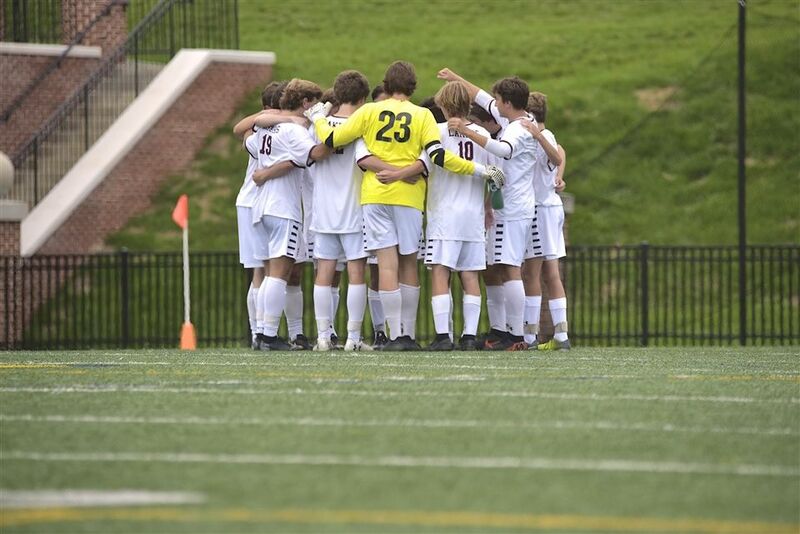 The varsity soccer team had an incredible season that saw the team fall just short of their primary goal of winning the championship. Despite this, the boys were phenomenal during the regular season, finishing with a 14-1-1 record to earn the top seed going into the playoffs. Overall, the team was 14-4-2, which included a 2-2 draw against Christ’s College from New Zealand in an International Friendly on Fall Festival. Hosting the boys from New Zealand was certainly a highlight of a season that had more than a few bright spots. From Day 1 to Day 80, a starting 11 typically comprised of 8 underclassmen improved every day, indicating that the future is bright on Lake Ave. The Seniors were wonderful this year; the team’s success started with the leadership, on and off the field, of Captains Blake Shepard, Jared Tankersley, Louis Marchese, and Harold Lloyd. Blake was the heart, voice, and soul of the team. Jared went from having a tough start to the season to winning the starting right wing job back and becoming one of the team’s best and most consistent players. Louis stayed mostly healthy during the season and anchored a defense that allowed less than a goal per game during conference play while also boasting seven clean sheets. Harold’s creativity and ability to create chances for his teammates was magic most matches, and his ability to control the tempo of games were critical to the team’s success. Sam Grace was the team’s second-leading scorer with 7 goals, due largely to the fact that the way he struck the ball on free kicks and corners was stunning. There is not a player in the conference more lethal than Sam in a dead-ball situation. Hunter Hegmann ‘21 also had an outstanding season as a central midfielder. His relentless work rate, skill on the ball, and field vision were usually just too much for conference opponents. In goal, Nate Brown ‘20 solidified himself as one of the best keepers in the conference. He finished his junior campaign with three shutouts, 52 saves, 2 assists, and a 1.12 GAA. His mobility in the cage, ability to play with both feet, distribution, and leadership all significantly contributed to the team’s success. However, no player had more to do with the team’s ability to win games than Avery Tankersley ‘21. He had 17 goals and 3 assists, and his ability to beat defenders in and around the box gave our opponents fits. His ability to go at the defender with speed and mobility often resulted in Avery being fouled. He drew three penalty kicks and numerous other fouls in dangerous areas that created a handful of goals off of free kicks (often converted by Sam). Avery’s physicality, athleticism, and technical ability were fun to watch. The season ended in the semifinals to eventual conference champion Concordia Prep, who rode an end of season hot streak to bring home the trophy. But the Lakers were resilient, courageous, and gritty all year, with much of the credit going to a Senior class that passed on the values which make up a successful team to the underclassmen. In victory and defeat, the 2018 Lakers are a team that will not be forgotten for the way that they improved every day, figured out ways to win close matches, and most importantly, loved and supported each other all season. The roster was loaded with talent. Offensively, the JV was led by Kofi Akuffo, Aiden Silverman, Jack Fishel, Liam Hescox, John Grieveson, and Kalen Stockton. Our leading scorer was forward Wade Bailey as we outscored our opponents 58-8. Defensively, we had numerous boys who were stellar in the back. Defenders Justin Kagen, Noah Goldstein, Cameron Sajadi, Griffin DeRocco, Jack Corrado, Nicky Brown, Finn Hopkins, and Ben Peake were tremendous. Our goaltending was also special, as starter Harry Genth only gave up three goals all season. This squad was deep with many contributions from a talented roster comprised of many players who will matriculate to the varsity next fall. These young Lakers were great sportsmen, wonderful representatives of our school, and an absolute pleasure to coach. We loved each other.